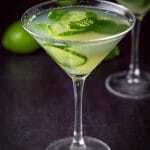 This is my cucumber mint martini recipe. 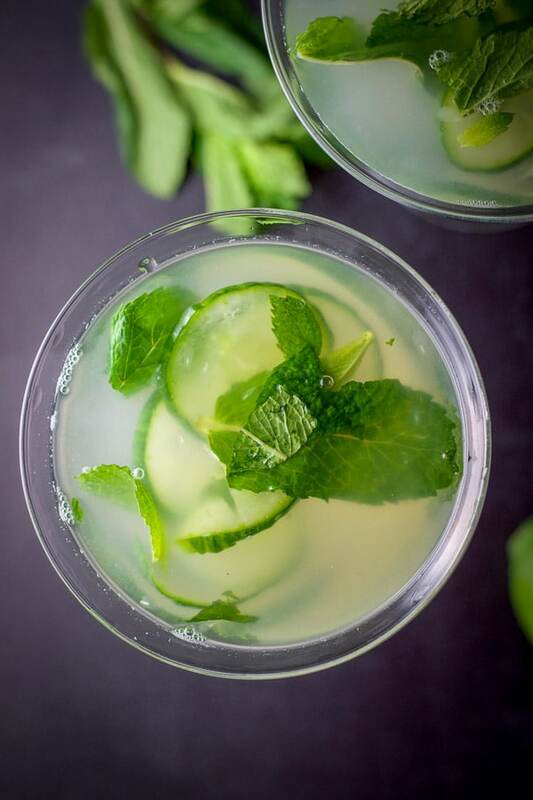 All the ingredients together make it slightly sweet, cool because of the mint and cucumber and so refreshing. It’s a taste to be savored and loved! So, cucumber mint! I’m doing a little hip swivel dance right now. This drink is so tasty, it’s unbelievable. I’ve been reading a lot about cucumber and mint paired together and while I love both cucumber and mint. I never really thought about them together. And definitely not in a cocktail. I thought, what is the big deal? So, I made one. Well, I get it now. Truly get it. I’ve concluded that I have to make it for everyone. Simply, everyone. That’s how good it is! Grab a cocktail shaker, muddler (or the back of a wooden spoon) and martini glass. All the ingredients will go in the shaker before the ice and vodka. 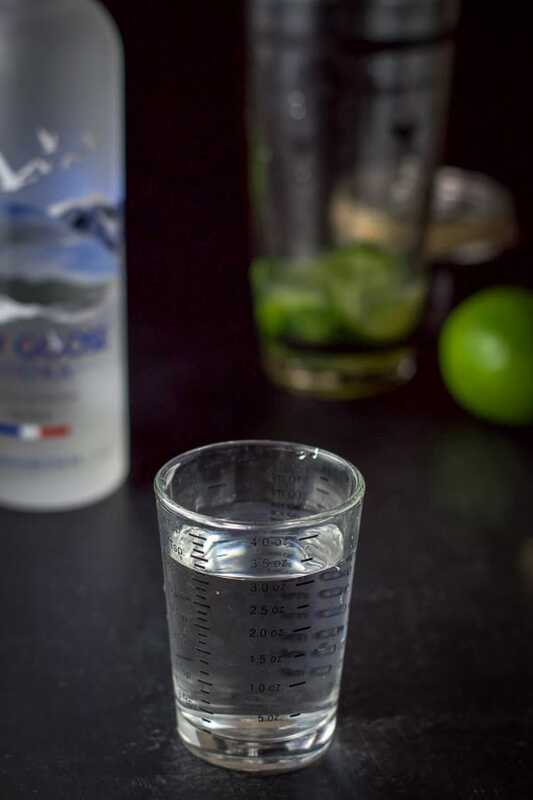 Once you measure the vodka, add to the shaker. 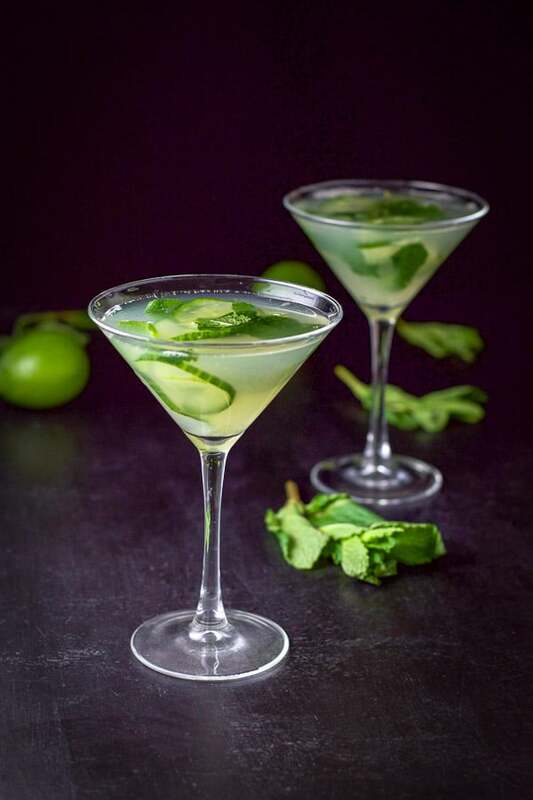 Gather the ingredients – cucumber slices, mint leaves, vodka, lime and simple syrup. Place cucumber, mint and half an ounce of simple syrup in the cocktail shaker. Squeeze out 1 ounce of lime juice. Pour the lime juice into the shaker. Take your muddler and muddle (crush the mint and cucumbers) for 2 – 3 minutes. You should be able to smell the lime without sticking your nose into the shaker. Fill the shaker half way with ice and measure 3 ounces of vodka. Cap the shaker and shake it for 15 seconds or you could also just stir it with a long cocktail spoon. Even though you see two cocktails, this recipe makes only one cocktail. Double it if you want to make two of them. 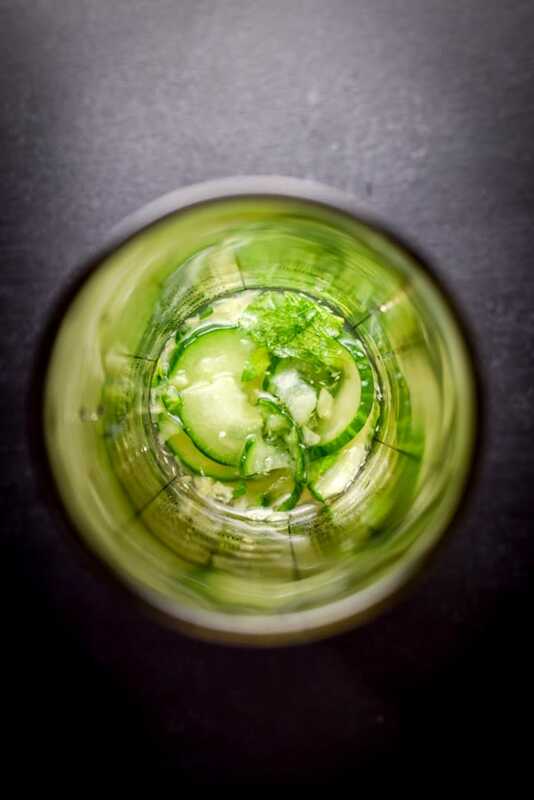 Strain the contents into the martini glass and fish out a few cucumbers and mint leaves and place them in the glass. I need to get on with this aerial shot because this drink is calling my name. LOUDLY. I sip the sweet ambrosia and sigh. He hates martinis. Enough said. 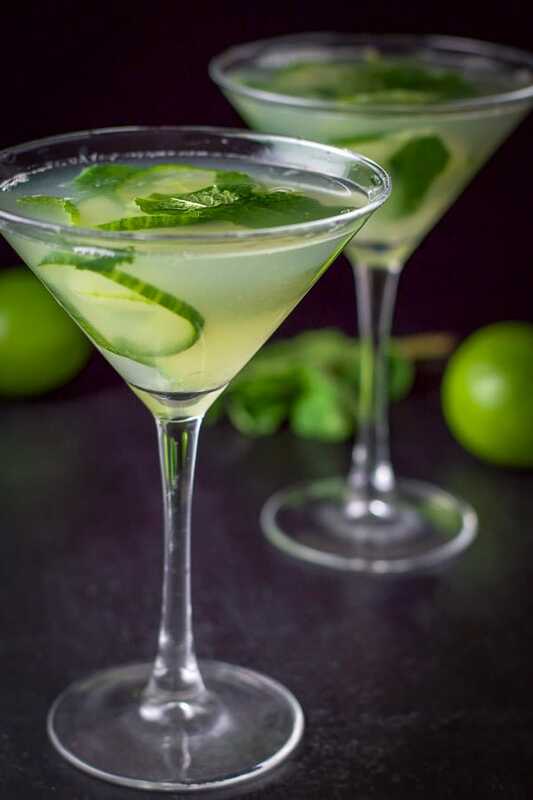 I hope you enjoyed this cucumber mint martini recipe. Leave me a comment if you know of an unusual ingredient or combination that makes a great cocktail. 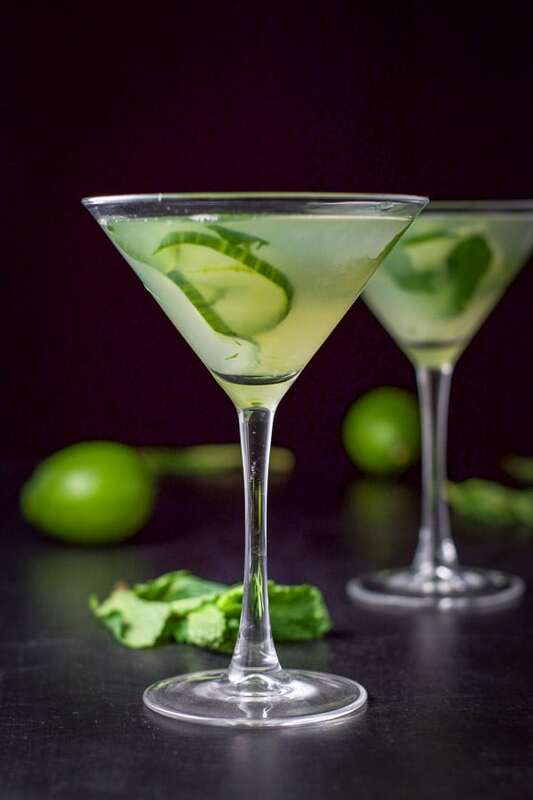 If you’ve tried this cucumber mint martini or any other recipe on the blog, I’d love the hear what you thought about it in the comments below. I love hearing from you! You can also FOLLOW ME on FACEBOOK, TWITTER, INSTAGRAM and PINTEREST to see more of my delicious food and delightful cocktails! This martini is so popular at our parties!! Indeed they are! Thanks Christopher! Oh my goodness that looks gorgeous! Thanks so much for the recipe. Shared! Thanks so much Jacqueline! It’s so tasty!! This looks so refreshing and yummy!! Perfect for spring and summer! I totally agree Mindy. 😉 Thank you for your comment! You are in for a treat! So yummy! Thank you Tracy. This is my kind of cocktail! This sounds so refreshing, especially when the weather has warmed up! Thanks so much Liz! Cheers!